Join us in Downtown Wilmington for the Fourth Friday Gallery Night on January 25th from 6-9pm, with special guest and jewelry designer, Roberto Vengoechea. 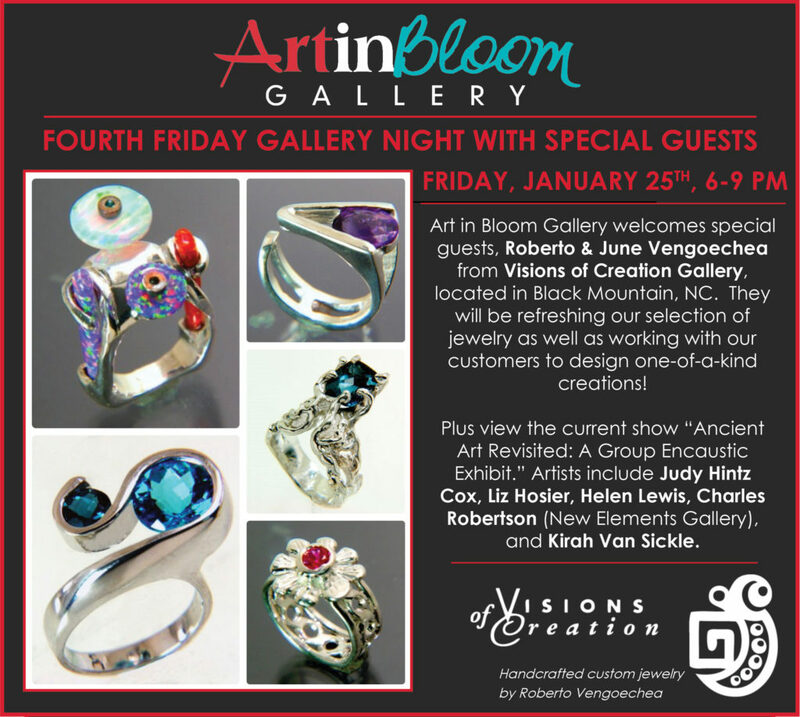 Our special guests, Roberto and June Vengoechea from Visions of Creation Gallery, will be visiting from Black Mountain, NC. They will be here to refresh the selection of one-of-a-kind jewelry at Art in Bloom Gallery as well as working with customers to design one-of-a-kind pieces! The current exhibit features paintings created with pigmented wax on surfaces such as wooden panels in the newest exhibit: “Ancient Art Revisited: A Group Encaustic Exhibit”. The wax is fused or burned via a heat source creating luminous qualities and colorful depths of layers. Artists include Judy Hintz Cox, Liz Hosier, Helen Lewis, Charles Robertson (New Elements Gallery), and Kirah Van Sickle. The exhibit continues through February 9th, 2019. In addition, view art by Elizabeth Darrow (oil and collage on canvas), Debra Bucci (oil on canvas), Traudi Thornton (ceramics), Dumay Gorham (sculpture), Brian Evans (ceramics), Richard Bunting (blown glass), Joan McLoughlin (painter), Bradley Carter (painter) and other artists. This entry was posted on Friday, January 25th, 2019 at 6:00 pm	and is filed under Special Event. You can follow any responses to this entry through the RSS 2.0 feed. Both comments and pings are currently closed.